Support and resistance levels are key prices at which buyers or sellers have previously entered the market in enough quantity that they halt or reverse the price movement. 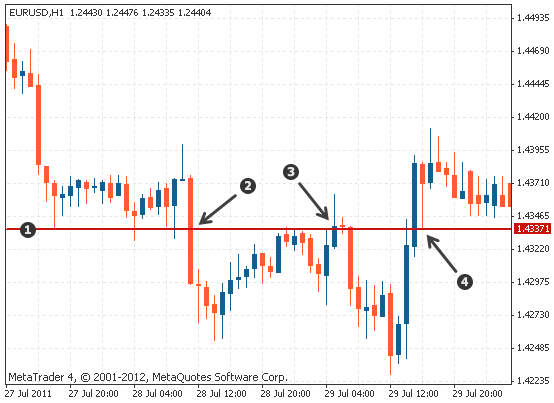 These price levels are used by traders to identify where buyers or sellers are likely to enter into the market again. They can be identified on price charts with horizontal lines where the price will come to a halt at the same level a number of times. The chart below demonstrates that if price is moving higher, it will eventually hit a "ceiling" — a point at which the price stops and reverses. This is where sellers are entering into the market. They do so in such sufficient quantities, that they overpower the buyers and stop the price from going up any further. When price is moving higher and hits a ceiling multiple times at the same level, a point at which price stops and reverses, this is resistance. When this happens, a resistance level has been identified where the price is likely to halt under selling pressure. If the price works its way back to a previously established resistance level, sellers are likely to enter the market causing the price to stop at this level and reverse. Resistance levels can therefore be used to enter into new short positions or as a profit target level to close current long positions. The chart below demonstrates that support identifies a price level where buyers are entering the market. If the price is moving lower, it will eventually hit a “floor” where buyers enter the market in such sufficient quantities that they overpower the sellers and stop the price from going any lower. When price is moving lower and hits a floor multiple times at the same level, a point at which price stops and reverses, this is support. When this happens, a support level has been identified. Support can be used in much the same way as resistance, but in this case, to either enter a new long position or to close a short position. 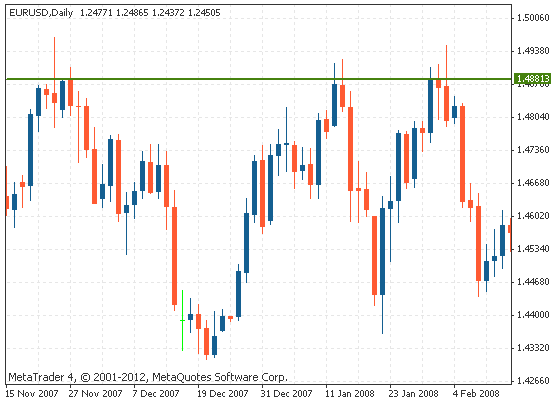 To identify support and resistance levels, you look at where the price repeatedly stops in the same place. This is where buyers or sellers are entering the market. The chart above shows an example where price seems to rise and stop at the same price level repeatedly. You can see in the chart below that by placing a horizontal line where the price seems to stop, it helps to identify a resistance level where sellers are entering the market and halting the price. The chart below shows an example where the price moves down to a level where it halts repeatedly and then reverses back to the upside. In the chart below, a horizontal line is placed at this price level to help identify a support level where buyers are entering the market and overpowering the sellers. 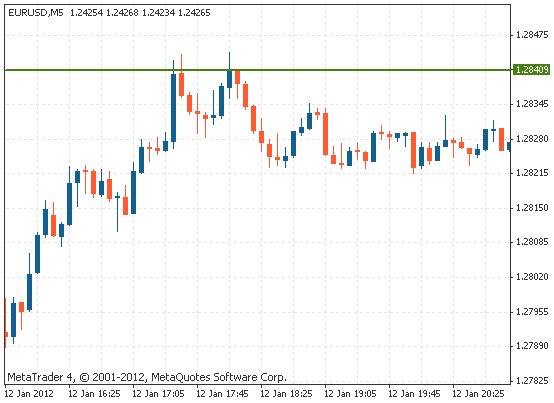 In a ranging market, the price encounters the same support and resistance levels several times before breaking out of the range. As you can see in the chart above, the resistance level provides a clear upper boundary and the support level provides a clear lower boundary to the range. 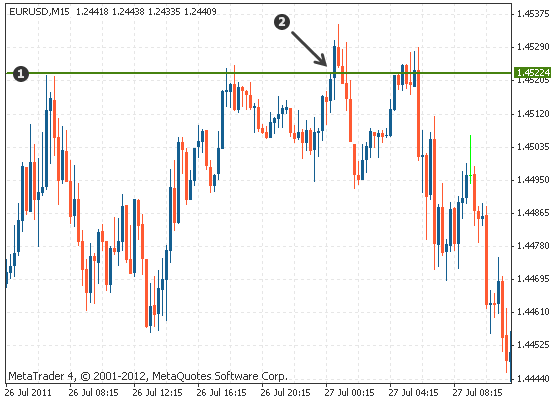 A breakout eventually occurs after the sellers overpower the buyers and break through the established support level. The following two charts show examples of placing support or resistance lines using the wicks and the bodies of the candles. 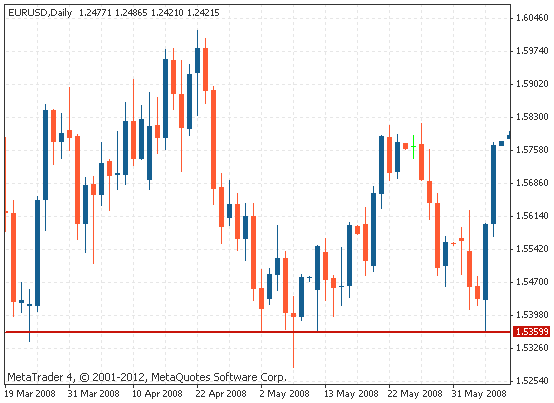 The chart below provides an example using the wicks of the candles to place a resistance line. The following chart shows an example using the bodies of the candles for the resistance line. There is no correct way to place support and resistance; it is a matter of using one or the other to suit the trader, or the strategy being used. Support and resistance levels cannot always be precisely established with a single line; therefore it is sometimes better to establish a zone. 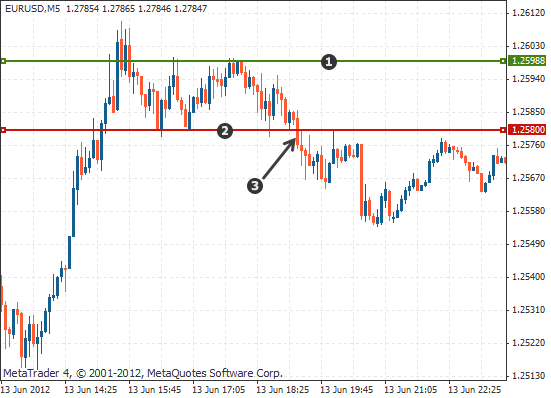 In the chart below, you see that the price encounters resistance several times at different levels. There is no single price level at which sellers are entering the market. The sellers overwhelm the buyers at different price levels. However, what is clear is that there is a resistance ‘zone’ where the sellers are entering the market. 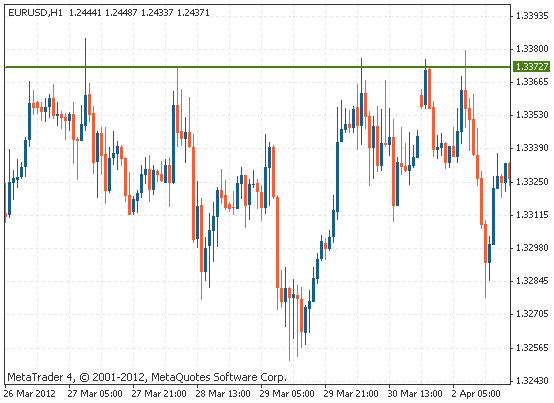 Price breaks through a support or resistance level when one side has overpowered the other. When the price breaks through support or resistance, it is not uncommon for the price to come back to the breakout level before continuing on. In these cases, support can become resistance or resistance can become support. To use the chart example below, the price broke through a resistance level, meaning that the buyers overpowered the sellers at this price. Those that sold at the resistance level would be taking a loss as the price continued to rise. As the price comes back to the previously established resistance level, those traders that went short would close their losing positions, bringing new buying pressure into the market. To close a long position, you sell your asset back to the market; to close a short position, you buy the asset. Traders who have not entered the market yet will also enter new long positions at this price level in anticipation of a price increase and the price will continue to rise under additional buying pressure. 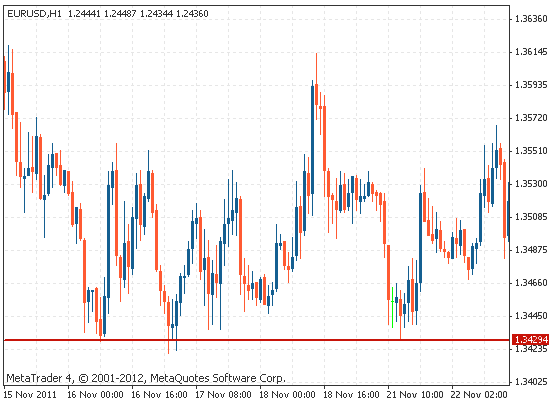 The previously established resistance then becomes a support level. Similarly, if the price breaks through a support level, when the price comes back up to this level, sellers will enter the market and the price will continue down. The chart below shows further examples of support becoming resistance and resistance becoming support. 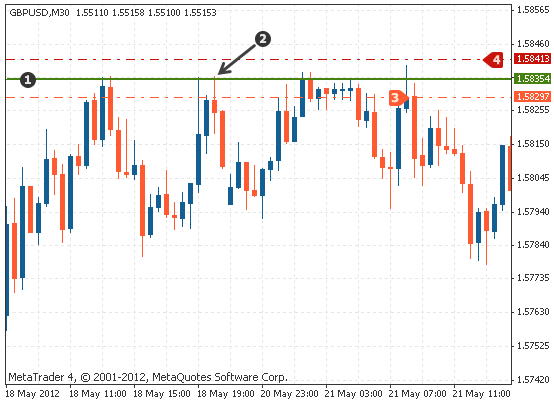 The same price level in this example acts as support and resistance multiple times. You can use support levels to enter long positions. As you can see from the chart below, a support level has been established. When the price falls back to this level, it is likely that the price will rise again and so the support level can be used for entering into new long positions. 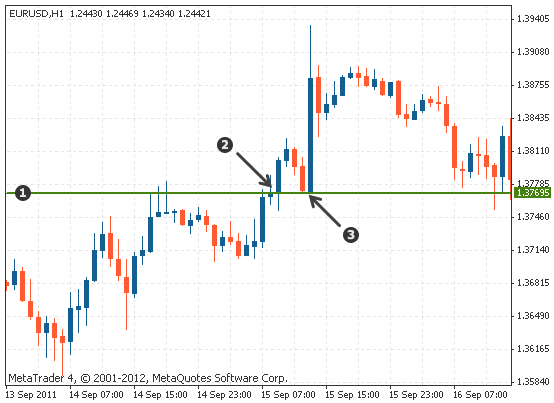 The stop loss would be placed below the support level. 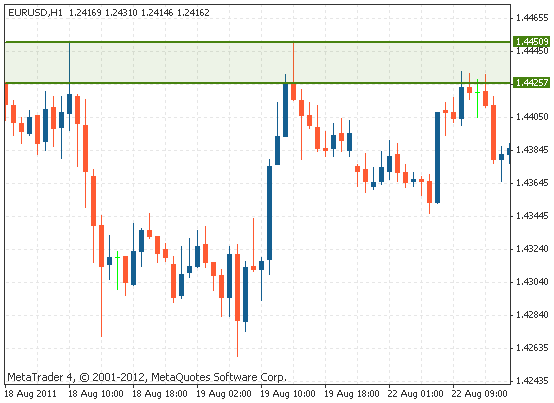 Similarly, resistance levels can be used to enter into new short positions. In the chart below, a resistance level has been established and so the price is likely to fall when the price comes back up to this price level. A new short position can then be entered at this price and the stop loss can be placed on the other side of the resistance level. The chart below demonstrates the scenario where the price appeared to break through a resistance level, but it did not stay above – this is known as a false breakout. If a trader is looking to enter into a long position once the price has broken through a resistance level, to avoid entering on a false breakout, it is better to wait until the previously established resistance level is shown to hold as support. Similarly, if a trader is looking to enter short trades once a support level has been broken, then the easiest way to avoid a false breakout is to wait until the support has held as resistance. Support and resistance levels are subjective; what may seem like a support or resistance level to one trader may not appear to be to another trader. It is easy to see too many support and resistance levels where you would expect the price to reverse. Picking only the best ones comes with experience. … support is a price level where there are enough buyers to stop the price from falling any further and reverse the price to the upside. … resistance is a price level where there are enough sellers to stop the price from rising any further and reverse the price to the downside. … support and resistance levels can be easily identified by placing horizontal lines on a chart where the price seems to stop repeatedly. … support and resistance may be drawn using the wicks or the bodies of the candlesticks, as long as you are consistent in your approach. … support can become resistance and resistance can become support. ... beware of false breakouts where the price seems to break through support or resistance, but reverses again in the opposite direction.